Ruby has been in my family for the past 14 years of my life. Right before my freshman year in high school my family and I went looking for a dog. We ended up picking a 6-month old pointer mix from the SPCA. I remember exactly how Ruby was when we first had her in the visiting room in the SPCA with us, how she was wildly wagging her tail, sniffing at us and so excited to be meeting people. We couldn’t not take her home with us after that. Her excitement and friendly nature would define her for the rest of her life, and our first big task in training her would be to get her to stop jumping up on people to smell them, followed by not pulling on her leash in an effort to meet each new person or dog, the latter we never could stop her from doing. 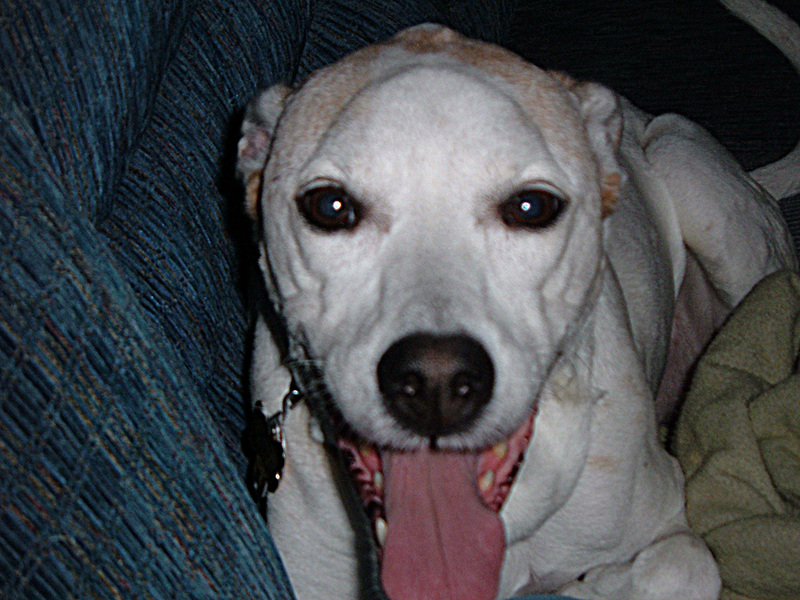 Ruby’s was very similar to a dalmatian, being slightly smaller with her weight being around 45 lbs, with small brown freckled spots covering her white coat in addition to the two large spots she had on one side. Like many other hounds of her type she was very vocal, more likely to make high-pitched yelps and other “talking” sounds instead of barks, the first greeting into my home that visitors had for years, at least until Bailey got her to bark “properly.” Her favorite thing of all was to meet people and to have them pay attention to her. Her tail would soon become the bane of visitors as she would whip it back and forth whenever she was happy, to the detriment of any unlucky shins nearby. And training her to sit and stay was always a struggle when she would sit down and whip that tail of hers like she was cleaning the floor while she sat up so prim and proper, her head held up while her front paws would dance up and down alternating as she would get anxious for her treat. We never did get her to shake hands properly as frustrated plus “give paw” turns into, “flail one paw out wildly until the treat appears.” Her white hairs have also permeated every single piece of fabric in my home. The hairs are short and white and she always seemed to be shedding them, the shape of them almost needle-like, threading themselves into everything and becoming almost impossible to remove. Ruby was always energetic and playful, and I spent many hours wrestling over ropes and working on that whole fetch concept with her. When it came to walks Ruby always wanted to go ahead of you, and would pull at her leash just a little bit to get where she wanted to be despite all attempts to get her to heel nice and ladylike. She was always good about staying in our yard, except when she wasn’t, and then she would adventure off wherever she pleased. Once she slipped out and when we found her she had walked half of the subdivision away to a nearby church, Bailey following her lead, the pair of them like two misbehaving kids sneaking out. It seemed like Ruby was destined to stay young forever, strangers mistaking her for a puppy or 1 year old dog until she was past ten years old. But time slowly began to catch up with Ruby. It started with small things, not greeting me or anyone else coming in the house in favor of staying put, no longer wanting to go for walks, and certainly not pulling on the leash. Her arthritis become worse and worse, and in this last year I’ve spent much of that time lifting Ruby up onto high beds and wrapping her in blankets so she can be in her favorite places and stay in the same room as wherever her mama was, her favorite place to be. Earlier this month we took her to the vet because she had lost a lot of weight. Were informed she had a mass on her spleen. The vet said the mass was most likely cancer but didn’t appear to be spreading, and they couldn’t confirm what it was without an ultrasound, and all that would do would tell us if she had an condition where the only treatment is surgery, something that you shouldn’t put a 14-year-old dog through. So we took her home and were given antibiotics, in case it wasn’t cancer, and were advised to give her a little extra pain medication if she needed it. We tried switching her to wet Beneful meals instead of the dry dog food she’d lived her life on and that seemed to convince her to eat more, and she ate up her new food with gusto, and put on 5 pounds in a few weeks, and with her added weight seemed to be doing better and getting along fine and comfortably. But last night on Valentine’s Day she suddenly showed signs for the worst. She had extreme difficulty walking and going outside to use the bathroom. Instead of going on the couch or following her mama to bed she instead went to her little dog bed in our living room, and even then she stumbled to get over the little trim of the bed. The whole family ended up spending that night in the living room to be with and comfort Ruby. The next morning we thought maybe she was feeling better as she got up to go outside, but once she got out she once again had such difficulty walking, and looked like she was “crumpling” from the strain. I was about to go outside and carry her inside when she finally mustered up the will and made it back into the house. After some more time with her and getting her to eat a few fistfuls of liver treats and some small nibbles of food hand fed we took her to the vet. She’d always liked being in the waiting room of the vet, and she insisted on standing and smelling what she could while we were there, but once we got into the examination room she was totally exhausted and went to lay right down on the blankets that had been laid out there and didn’t even budge when the vet examined her. So after much discussion we decided it was best to put her to sleep, and so at 10:15AM eastern time today, Ruby passed away laying next to me on those same blankets while I pet her. She was the first dog I’ve ever had. When we got her Clinton was running against Bob Dole to clinch his second term in office, Duke Nukem 3D had just come out, WordPress and Livejournal didn’t exist yet, and America Online hadn’t yet unveiled their $19.99/month unlimited access plan which ushered the majority of America onto the internet. It’s still hard to believe she’s gone. I’d almost do anything else other than be writing this now, but I don’t want to forget today, and immortalizing this on my blog is the best way I know how to make sure I remember how I feel right now. Goodbye Miss Ruby. I’ll miss you.